Woman Wearing Brainwave Scanning Headset Sits in a Chair while Scientist Supervises. 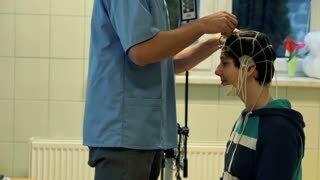 In the Modern Brain Study Laboratory Monitors Show EEG Reading and Brain Model. Man Wearing Brainwave Scanning Headset Sits in a Chair while Watching Stimulating Images on Display. In the Modern Brain Study Laboratory Monitors Show EEG Reading and Brain Model. 1980s: women sit at desk and read paper in office with bookcases. print outs show eeg and eog for sleeping, sleep and awake walking. boy with bandages around head pushes locked door. In Laboratory Scientist Wearing Virtual Reality Headset Sitting in a Chair Interacts With Monitors Showing Brain Activity Information. 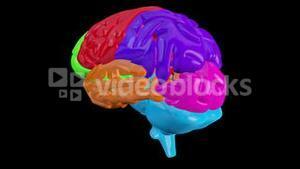 Modern Brain Study/ Neurological Research Center. In Laboratory Man Wearing Brainwave Scanning Headset Sits in a Chair with Closed Eyes. Monitors Show EEG Reading and Graphical Brain Model. In the Modern Brain Study/ Neurological Research Laboratory. Two Scientists Have Conversation while Using Tablet Computer In the Modern Brain Study Laboratory, Monitors EEG Reading and Brain Model Functioning. In Laboratory Scientist Wearing Virtual Reality Headset Sitting in a Chair Interacts With Monitors Showing Brain Activity, and Neurological Data. Modern Brain Study/ Neurological Research Center.